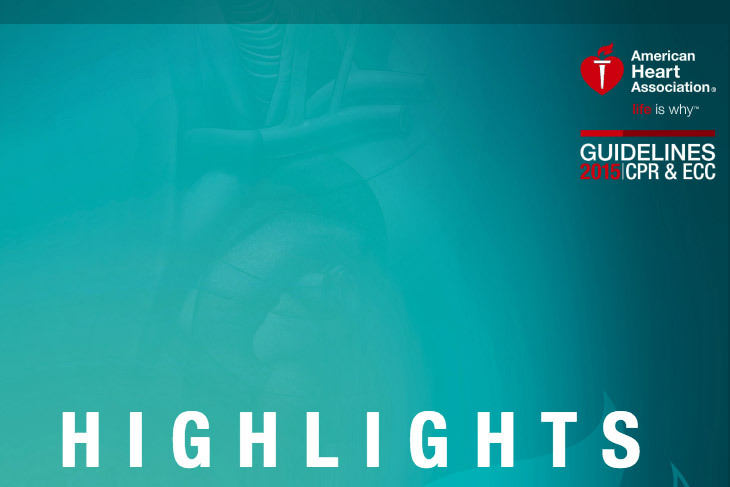 This “Guidelines Highlights” publication summarizes the key issues and changes in the 2015 American Heart Association (AHA) Guidelines Update for Cardiopulmonary Resuscitation (CPR) and Emergency Cardiovascular Care (ECC). It has been developed for resuscitation providers and for AHA instructors to focus on the resuscitation science and guidelines recommendations that are most significant or controversial or those that will result in changes in resuscitation practice or resuscitation training. In addition, it provides the rationale for the recommendations. Because this publication is designed as a summary, it does not reference the supporting published studies and does not list Classes of Recommendation or Levels of Evidence. For more detailed information and references, readers are encouraged to read the 2015 AHA Guidelines Update for CPR and ECC, including the Executive Summary, published in Circulation in October 2015, and to consult the detailed summary of resuscitation science in the 2015 International Consensus on CPR and ECC Science With Treatment Recommendations, published simultaneously in Circulation and Resuscitation.